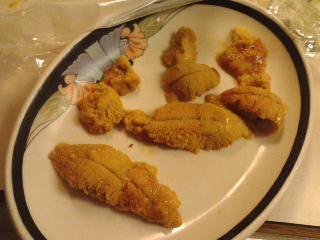 First, I like to take fresh live uni and clean it myself. It can be a messy situation so make sure your workspace is covered. Best way is to use scissors to cut into the mouth of the sea urchin (sorry I don't have a pic of that!). 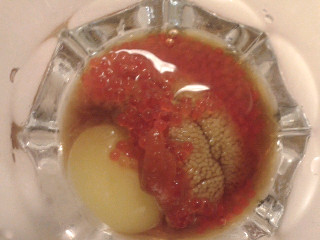 Then start peeling off the outer shell carefully as to not mess up the roe inside. Now a bunch of purple guts will be inside so you have to be careful when peeling them out. You can use the water from the sink to gently help rinse them away too. 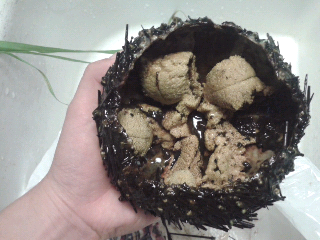 Now removing the urchin roe is a delicate process if you don't want them to break and get mushy. Just be gentle and take your time while doing this process. 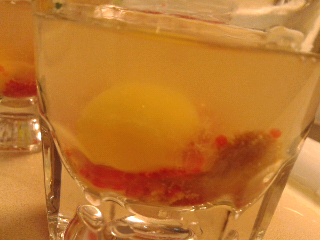 Now the first shot I had actually had alcohol in it. This really isn't necessary but it is pretty decent. I'd suggest Grey Goose Vodka or some type of gin. Buttt, other than that, here's what I added to the Uni shot besides alcohol. hah. Raw quail egg yolk (make sure to really get the excess whites off), tobiko (flying fish roe), ponzu (a soysauce with lemon/lime), and a bit or Sriracha hot sauce. Either place on a big spoon or shot glass and bottoms up! Based in Seattle, KFC Loves You has evolved slowly into a creative space to share all things lifestyle posts. You can find content on travel, fashion, food, and more! Thank you for stopping by and feel free to drop me a line! © kfclovesyou. Powered by Blogger.